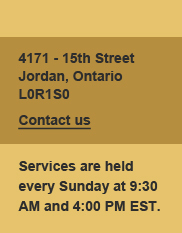 This is a ministry that seeks to evangelize, teach and disciple prisoners throughout Canada. Pastor Marty Slingerland serves in the British Columbia prisons and is partially supported by our church. Members of our congregation are involved in working with individual prisoners through Bible correspondence courses. Members of our congregation help in various ways in the ministry in downtown St. Catharines. This is a ministry that seeks to help those who need special assistance.